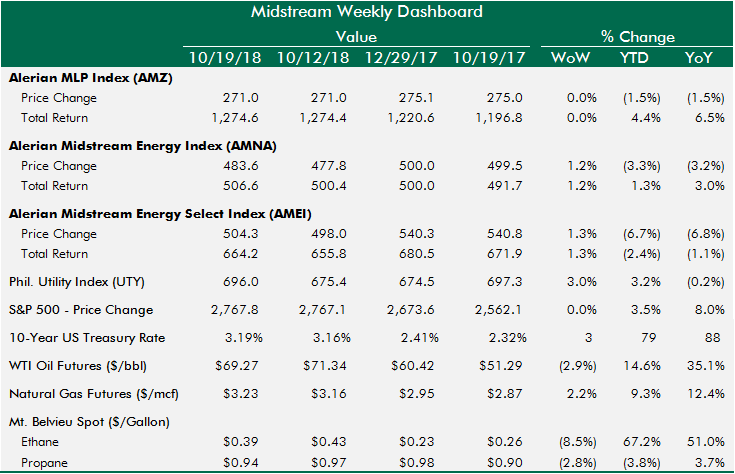 Midstream had another strong relative performance this week. 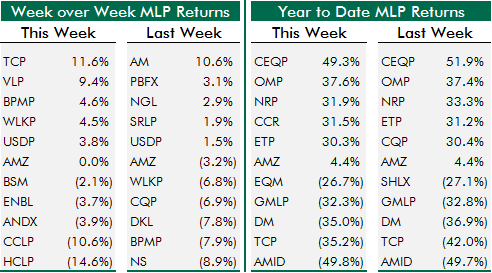 The MLP Index was flat week over week, on par with the S&P 500 (which also miraculously finished the week virtually unchanged). 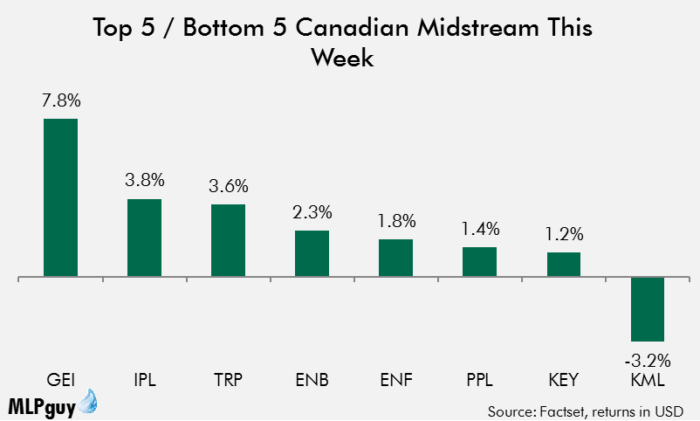 Broader North American non-MLP midstream outperformed, led by Canada, OKE and KMI. The broader energy sector was hit by lower oil prices and underperformed (XLE -2%). 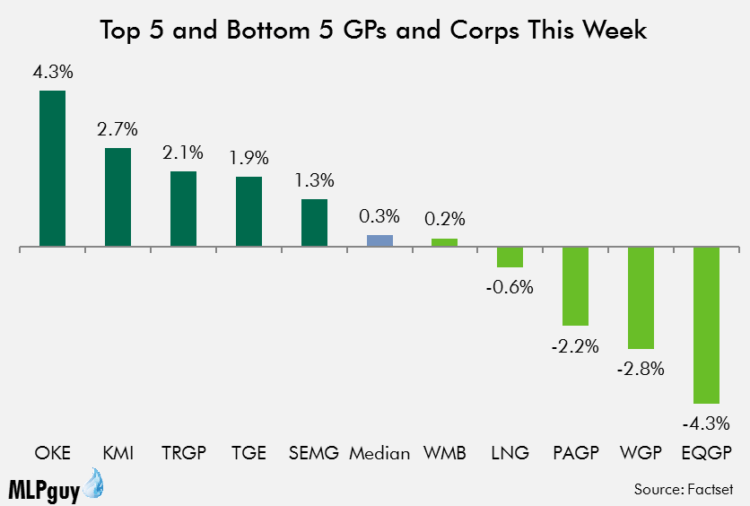 Utilities held all the winning numbers again this week and continue to counterintuitively outperform in a rising rate environment, on an apparent flight to safety trade. Since 8/23, the interest rate on U.S. 10-year Treasuries has risen 38 basis points, and utilities (UTY) have gained 2.4% in value, while midstream and MLPs have lost more than 5% of their value. You've probably heard about the Dogs of the Dow, which is either used to highlight poor performers or to screen for potential mean reversion looking forward. Today, I'd like to introduce you to 4 Mutts of Midstream. These are major players in the midstream game, combining to represent 37% of the midstream universe by market cap. Each has undertaken major strategic transactions in 2018, but each has traded down this year so far (not including distributions). They are Kinder Morgan, Enbridge (NYSE:ENB), Energy Transfer (NYSE:ET), and Williams Companies (NYSE:WMB). ...but still faces a few months before closing simplifications and a few hurdles to construction. ...but has poor corporate governance when compared with corporate options and has a somewhat limited potential investor base given K-1 MLP structure. ...but has limited operating leverage and growth questions. ET has performed best at nearly flat. ENB has traded worst in USD terms, with an assist from weaker Canadian dollar. Below are some valuation statistics on each based on average estimates from three top midstream sell-side research analysts. They each trade at relative discounts to the universe on several metrics. TCP (rate settlement on GTN) and VLP (takeout) had positive news that helped both rally this week. 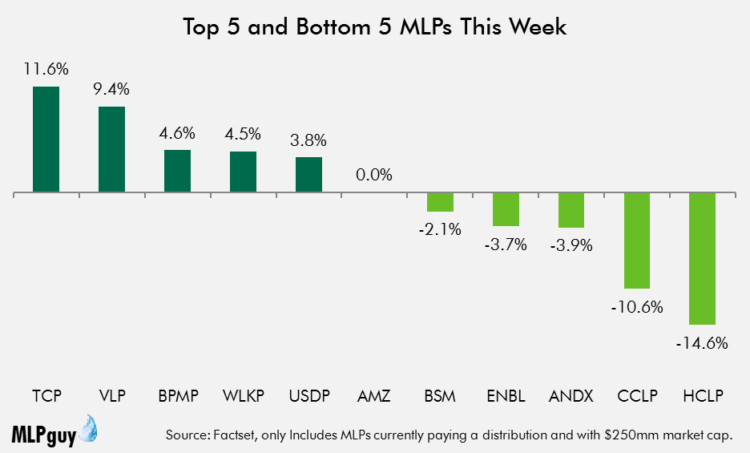 VLP's buyout announcement on Friday didn't spark a broad rally in drop-down MLPs, like SHLX, BPMP and WLKP. Those last two were among the biggest winners this week, but that was more of a bounce back from last week's sell-off where they were both in the bottom 5. Services MLPs CCLP and HCLP were hammered this week and finished near the bottom, tracking oil and energy stocks lower. As noted, BPMP and WLKP went from bottom 5 to top 5. USDP repeated near the top. 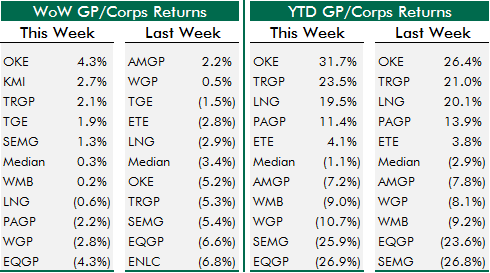 On the YTD leaderboard, CQP dropped out of the top 5 replaced by CCR. EQM returned to the bottom 5, replacing SHLX. Note that ETP and its 30% return YTD will be replaced in the above charts with the new ET entity starting next week. KMI's earnings this week brought some attention and outperformance, but that was the only significant news items of the week for this group. OKE, TRGP and SEMG bounced back from selloffs as investors position ahead of earnings. EQGP was near the bottom again this week, as the market seems to have lost interest as the spin off approaches, but maybe earnings next week changes sentiment. EQGP reclaimed the bottom spot on the YTD leaderboard this week. EQT's MLP experiment was working quite well until it entangled with Rice, ran into delays on MVP and dragged its feet on simplification. 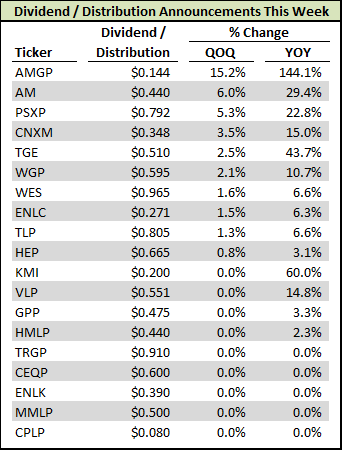 It's been pretty terrible for EQM and EQGP investors. Canadian midstream outperformed U.S. midstream and MLPs this week. Each one of the stocks in the group were positive with the exception of zombie stub company KML. Gibson (OTC:GBNXF) announced additional terminals at Hardisty, which helped it propel itself even higher after several weeks of outperformance. On the YTD leaderboard, performance largely tracks inverse market capitalization, with the smallest company Gibson far outpacing the group. Mega-caps TRP and ENB are bringing up the rear, and in between names trading in between. Another week another zombie MLP, but this one (VLP) won't linger very long as a zombie. We also retired the largest zombie MLP out there, when we said goodbye to ETP, which was actually legacy SXL that went public in 2002. Also, 28 interstate pipelines filed 501G forms this week. What would John Elway Do?